These pictures of Jude Law on the set of The New Pope in Venice yesterday don’t really need much explanation. He’s reprising his role as Lenny Belardo and John Malkovich also stars, no story details have been released but… I mean… I can’t imagine he’s still the Pope. Or, you know, maybe he is. Jude’s Pope’s Pius XIII was ruthlessly assertive. But, wait, he was also a hardliner. I don’t know that frolicking on the beach in papal white holding hands with a woman would be part of the plan although, the whole thing with Lenny was that he always has his own agenda. 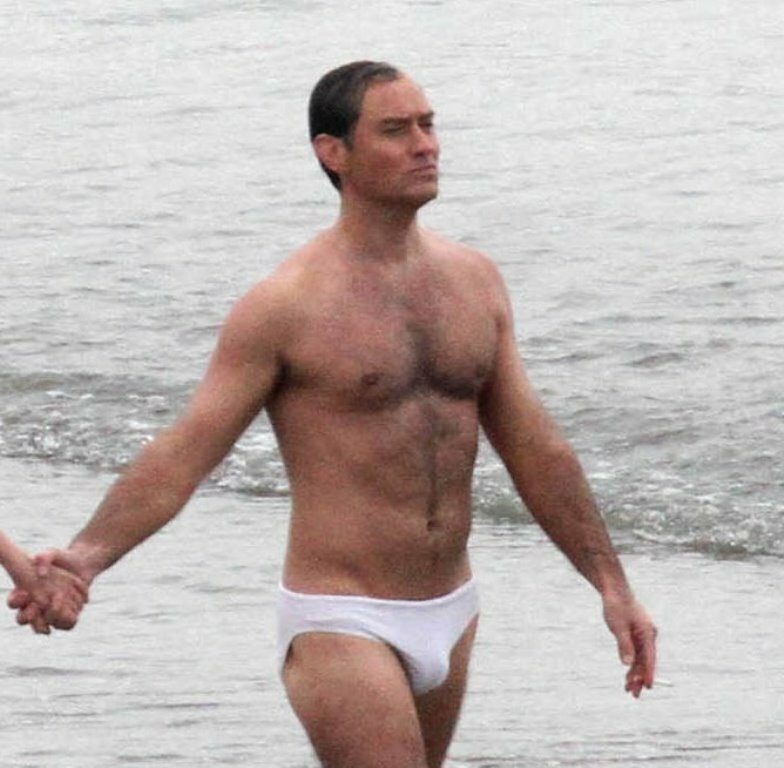 Anyway, let’s focus on Jude in this white speedo sauntering down the beach in character with a cigarette in one hand. In character but…for a minute there? I could totally see this happening in real life too. Not that he’s ever been photographed in real life on holiday in speedos, I’m just saying, if you asked me to name a celebrity who I could see on a beach in a tiny white speedo, Jude might be at the top of the list. And while this is not my swimwear preference for attractiveness, he could do worse, you know? Others could do worse. For example, I never, ever want to see Robert Pattinson on a beach in a tiny white speedo and I’m not dry-heaving at the sight of Jude Law. Also these speedos are actually quite impressive because he’s wet and they’re not transparent at all. You know how hard it is to find a white woman’s swimsuit that’s cute and isn’t transparent?